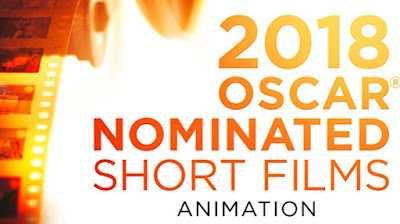 Death, fairy tales, bullying, a player’s love of his game, and frogs are the subjects of this year’s group of Oscar-nominated animated shorts which are playing at various theaters near me alongside programs of the likewise nominated Live Action and Documentary shorts. The 90th Academy Awards® will be broadcast live on March 4th, so there’s plenty of time to catch up with these short films, and good reason too as they’re a pretty pleasing batch. The first animated short, Glen Keane and Kobe Bryant’s DEAR BASKETBALL, is Bryant’s love letter to his sport, based on a letter he wrote to The Players’ Tribune in 2015 announcing his retirement. Bryant is depicted in sketchy hand-drawn animation from when he was a child shooting imaginary game-winning shots with rolled-up tube socks in his bedroom, to imagery of him making his famous moves that won five NBA championships with the Lakers as an adult. It’s a swift and fluid five minute film, but it feels like a commercial or beginning of a feature length documentary. It’s no doubt a sincere, and well-intentioned ode, but it still struck me as self-promotion and I wasn’t moved by it that like I bet somebody who’s a fan or into basketball would be. Anyway, onto a very differently toned short, GARDEN PARTY which was written and directed by Victor Caire, Florian Babikian, Vincent Bayoux, Théophile Dufresne, Lucas Navarro and Gabriel Grapperon. That’s right, it was made by six French 3D artists, who dub themselves Illogic Collective, during their studies at MoPA, animation school in France. The seven minute movie concerns a group of amphibians exploring the immaculately detailed grounds and interiors of a mysteriously abandoned mansion. The frogs and toads swim in the pool, feast on rotten food, and inadvertently turn on the house’s lights, stereo system, and outside sprinklers by jumping on the buttons of a control panel. The photo realism is stunning, so much so that the visuals border on the grotesque especially when we find out what happened to the estate’s former resident. These students’ production definitely deserves to win, but I’m thinking that because of its dark undertone it’ll probably be passed over. 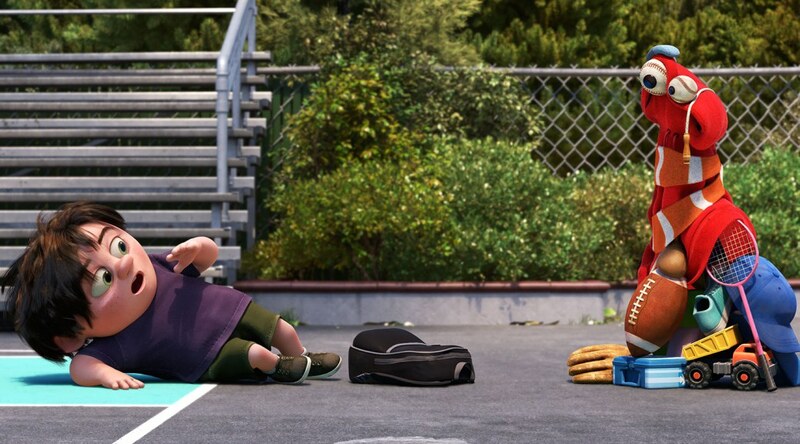 Every year, Pixar has a short in competition and Dave Mullins and Dana Murray’s LOU, about a schoolyard bully being taught a lesson by the contents of a lost and found box, is their entry this time around. In a colorful animation style that should be well familiar to anyone who’s seen any of the Disney subsidiary’s movies, the film tells the story of a mean kid who steals his classmates belongings – such as a red hoodie, a couple of baseballs, a football, a piggy doll, a pitcher’s mitt, an orange and white scarf, a slinky, a toy truck, a jump rope, a book, a shoe, a lunch box, a hat and a tennis racket. I listed all of those items because they come together to form an anthropomorphic character with the baseballs as its eyes. After a hilarious scuffle, the bully is punished by having to return all the things he stole, and is redeemed just as you thought he would be. LOU, which originally ran before showings of CARS 3, is a predictably pleasing six-minute piece of fast paced Pixar fun, but since they won last year with the charming PIPER, I doubt this is their year. The following short, Max Porter and Ru Kuwahata’s NEGATIVE SPACE also concerns the assorted contents of a box, but this time it’s a suitcase and it’s about a father teaching his son how to properly pack it for a trip. 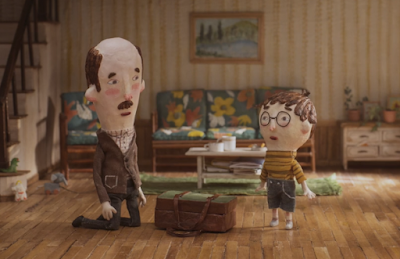 The French film is an adaptation of a poem by Ron Koertge via a neat-looking stop motion world of models and miniatures. 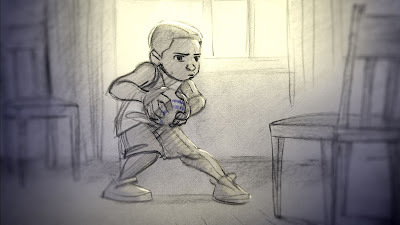 It’s a charmer with a touchingly witty conclusion, and, funnily enough, it’s the second short of the bunch that animates the rolling up of socks (DEAR BASKETBALL is the other). I can totally see this one winning. 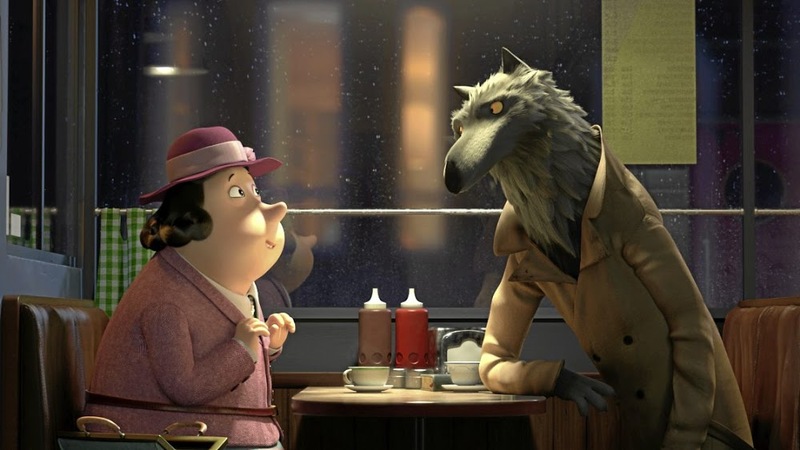 At 28 minutes in length, Jakob Schuh and Jan Lachauer’s REVOLTING RHYMES is the longest of the animated shorts. It is an adaptation of a 1982 Roald Dahl book of poems satirizing six famous fairy tales that’s narrated by The Wire’s Dominic West as the big, bad Wolf. The Wolf tells his story to a kindly woman in a café about Red Riding Hood and a blonde Snow White meeting at the funeral for Snow White’s mother. We learn that Red Riding Hood keeps her money in a bank made out of many piggy banks run by one of the three little pigs, and that Snow White’s father, the King (voiced by Rob Brydon of those TRIP movies with Steve Coogan) marries a crude woman, Miss Maclahose, who has a magic talking mirror for the “who’s the fairest” bit. The seven dwarfs appear as ex-horse race jockeys, who ask the mirror which horse to bet on as Snow White pines for her Prince, and so on. 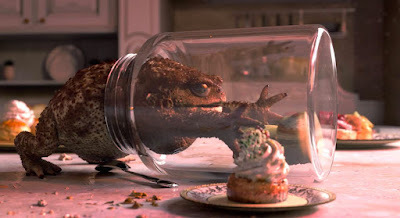 Dahl’s dark spin on these familiar stories is illustrated by computer animation that at times resembles the work of Aardman Animations (Wallace & Gromit) despite not involving clay. The rhymes aren’t really revolting, but there are some grim fates for some of the characters. As the film feels a bit stiff, it may be my least favorite of the animated shorts, but the British-German production just may tickle enough Academy voters to get it the gold. Since four of the five films run around five to seven minutes, there are three bonus shorts to pad out the Animated Shorts package to feature length: Kevin Hudson’s WEEDS, Daniel Agdag’s LOST PROPERTY OFFICE, and Lucas Boutrot, Élise Carret, Maoris Creantor, Pierre Hubert, Camille Lacroix, and Charlotte Perroux’s ACHOO! I ‘m not going to go into any detail about these “commended” shorts, but I will say that ACHOO! about a sneezing Chinese dragon who invents fireworks is my favorite of them. If you haven’t already check out my reviews of the Oscar® Nominated Live Action Shorts. With a few exceptions, I’ve found it to be a fine fall for film. The movies that have stood out to me include THE MARTIAN, BRIDGE OF SPIES, STEVE JOBS, SICARIO, ROOM, SPOTLIGHT, and CREED (click on the titles to read my reviews), but there are many more that I have seen over the last few months but haven’t blogged about yet. So I thought I’d take a look back, and clean out my notebook in the process, especially because a bunch more movies are coming fast. 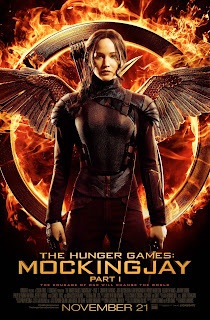 I’ll start with what’s currently #1 at the box office, Francis Lawrence’s THE HUNGER GAMES: MOCKINGJAY – PART 2, the fourth and final film in the popular franchise. 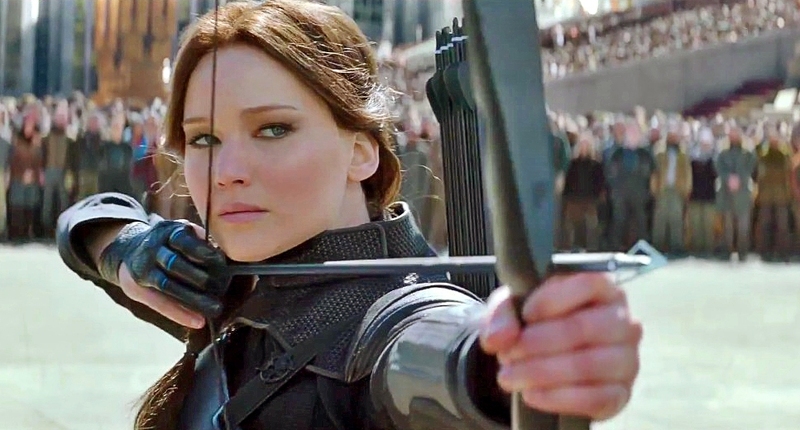 I enjoyed the first two entries in the series, but haven’t been into either half of MOCKINGJAY. PART 2 is a washed out slog through bleak terrain with very little action (certainly not of the fiery kind that the poster implies) or emotional connection. Jennifer Lawrence and the rest of the cast make the most out of the murk, which has to do with our arrow-shooting heroine, Katniss Everdeen, and crew taking down the evil Capitol or some such, but I was so ready for it to end way before it did. 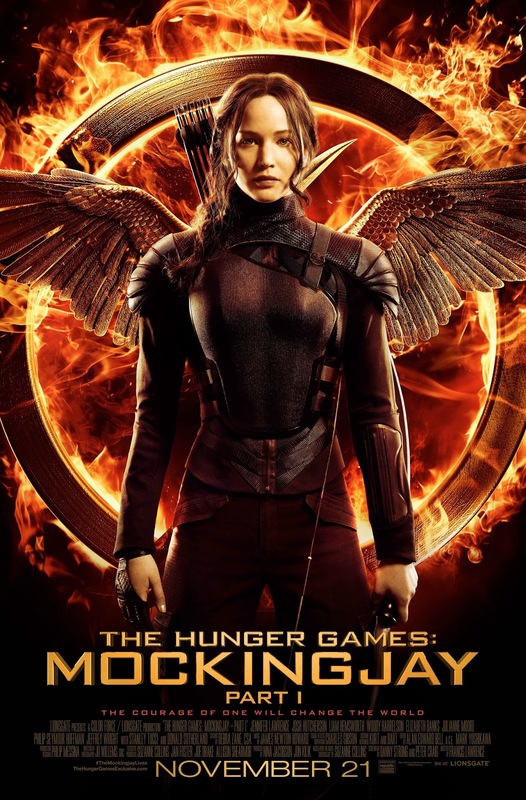 The most notable, and maybe the most depressing, part is that it contains the last film work of Philip Seymour Hoffman, whose loss can really be felt in a concluding scene in which a letter from his character to Katniss has to stand in for him. Next up, a few weeks back I had the choice between an advance screening of CREED and the new Pixar movie, Peter Sohn’s THE GOOD DINOSAUR. 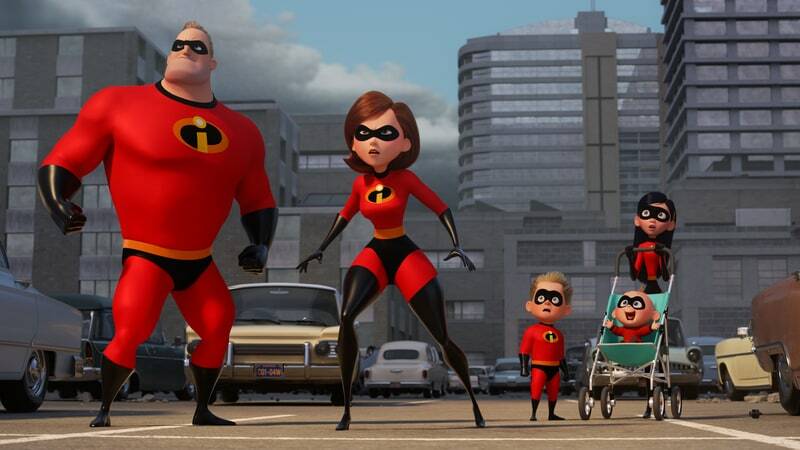 Because of their track record, I went with Pixar. I chose…poorly. The obvious upside is that the film, set in a world in which dinosaurs never went extinct, is gorgeously animated with stunning photo-realistic landscapes and vibrant colors that really pop in 3D. 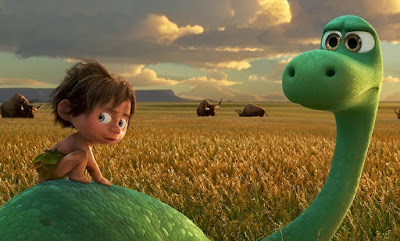 The downside is that, after half a decade of development hell with changes in director and voice cast, the resulting film’s story, about Arlo the Apatosaurus’ adventure accompanied by a feral caveboy, is probably Pixar’s least substantial. After the screening, I joked with friend, and fellow blogger, William Fonvielle of Filmvielle, that it needed a MacGuffin, but it probably really needed a few more re-writes. A much better animated feature this season, is Steve Martino’s THE PEANUTS MOVIE, the first “Peanuts” film in 35 years (the last one, BON VOYAGE, CHARLIE BROWN (AND DON’T COME BACK! 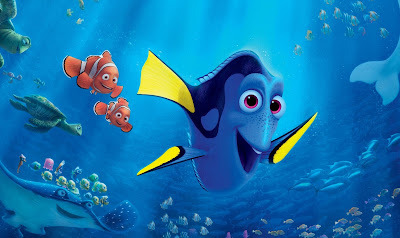 ), I saw as a kid at the theater – I’m old). 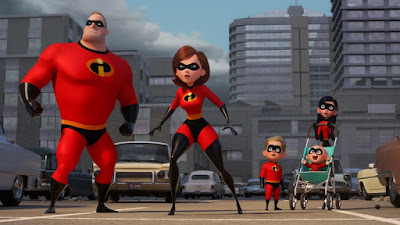 It’s apparent that the filmmakers, including Peanuts creator Charles M. Schultz’s son Craig, and grandson Bryan, who co-wrote and co-produced, took a lot of care in paying proper tribute to the style, tone, and sentiment of the original strip (and the TV specials and movies), right down to every character’s expression. 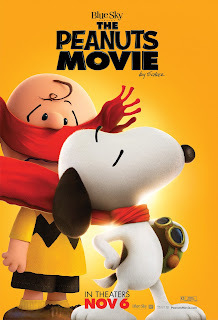 The premise, involving Charlie Brown trying to impress the ever elusive Little Red-Haired Girl, is full of humorous and heartfelt moments, and Snoopy’s subplot, involving his imaginary WWI air battles with the Red Baron, is pretty entertaining too. The animation may be a little too fancy – such intricately applied shadows and lighting on these kids’ faces seem a bit much at times – and I could’ve done without the pop song concessions, but this enjoyable update acutely captures Schultz’s ‘loser who wins’ spirit. Eillis’ learns that her sister Rose (Fiona Glascott) back home in Ireland has died and she decides to return home, but before she goes, she and Tony get secretly married at City Hall. Once back home she finds herself with a new suitor (Domhnall Gleeson) while letters from Tony stack up unopened. So our heroine, who grows more and more confident as the film progresses, has to make a choice between the two vastly different lifes. The screenplay, adapted by Nick Hornby (HIGH FIDELITY, AN EDUCATION), is tenderly written, giving Eilis’ story a lot of resonance, and it’s a handsome looking film, warmly shot by cinematographer Yves Bélanger (WILD, DALLAS BUYER’S CLUB). 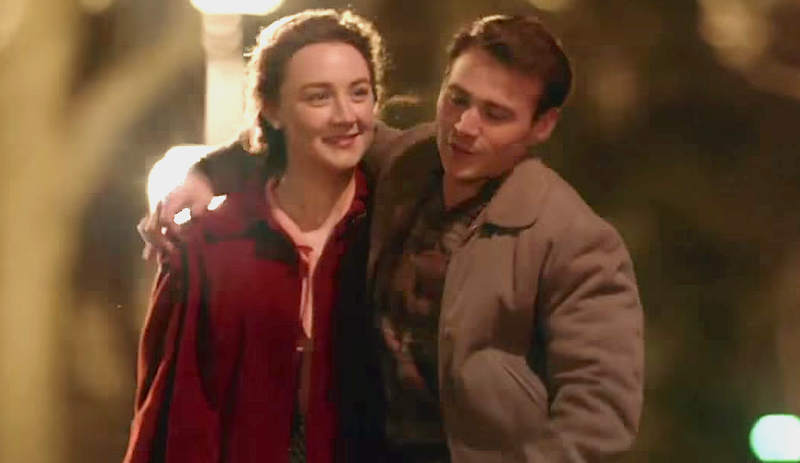 Although there’s another ‘50s-set drama (hint: it stars Cate Blanchett) soon to release that’s far superior, BROOKLYN is a beautifully drawn drama that is sure to get plenty of awards season action.